As mentioned in the previous post, I was at Imperial Palace for a few hours last night. I wanted to see if they had managed to get their new poker room open as scheduled. They had. This post's title is kind of misleading, I guess, in that the implied next words do not pertain; that is, the room is neither a little bit louder nor a little bit worse. Here's the rundown, item by item, as I see it. Tables: Lovely two-tone tan felt, very nice. Normal size, for a change. Still playing ten-handed. But these are rickety folding tables, clearly not meant for permanent use. They wobble like crazy anytime somebody puts his elbows on the table, or removes them, or pushes away from the table, or whatever. That's annoying. No built-in cupholders. Shufflers in every table. Noise: I couldn't tell that it was meaningfully more or less noisy than before. Smoke: Last night it seemed less bad than the old spot. 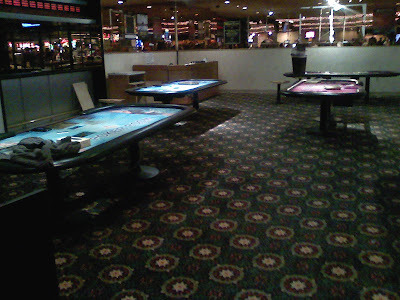 But if you look closely you might be able to see that the poker "room" is just roped off from the slot machines on two sides, and a couple of the tables are right next to the ropes. 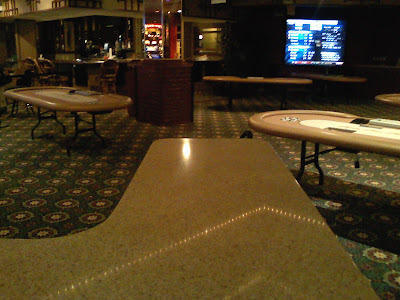 Some players had already figured out that they could just duck under the rope for a drag, come back to the table to play a hand, fold it, step back for another puff or two, repeat as needed. That occasionally transpired in the old room, but it required several more steps and was harder to coordinate, so it wasn't a frequent occurence, in my experience. I think it will be more common now. I don't think there is going to be much overall improvement, and it might be somewhat worse. When you can smoke literally three feet from the table, calling it a "non-smoking" room is laughable. Service: The check-in desk is now the same place from which to buy chips. This avoids having to walk to the back of the room for chips before being seated. However, it can also mean longer waits for everybody, because the list management functions are competing for a tiny space with the cashier. Last night I had the surliest cashier I've ever encountered in a poker room. I tipped her a buck when cashing out, as I usually do. Then when putting my money in my wallet, I noticed that I had a surfeit of 20s, and asked her to change ten of them for two Benjamins to reduce the wallet bulge. She had completely undisguised contempt for me daring to impose on her in that way--scowls, sighs, rolled eyes--even though the extra transaction cost her not more than 15 seconds, when she wasn't doing anything else anyway. That was the last time I will tip her for doing her job. 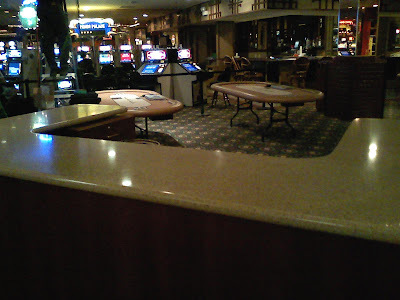 TVs: With rare exceptions, I pay only minimal attention to the televisions in poker rooms anyway, but I did notice that there are only a couple present, and many seats have no view of any monitor at all. Lighting: This may be the best part of the upgrade. IP's old poker room had about the crappiest table lighting in the city. The new room has done a far, far better job of that. At least the table I was sitting at last night was perfectly illuminated for my taste: bright and even, with no glare. Temperature: I'm sure this will fluctuate from day to day and season to season, but if last night was any indication of a trend, you could use the extra space in the room for aging beef carcasses. It was about the coldest I've ever known a poker room to be. Ridiculous. Space: There is quite a bit more space between tables than before, but it was still a bit tight if two people back-to-back at adjacent tables were trying to enter or exit at the same time. Traffic: Unlikely to be any difference, since the two spaces are literally only about a dozen steps from each other. Reception: The old room was a perennial dead zone for my AT&T cell phone. I always had to step outside for a Twitter update or to send a text message. Even though the new room is only a short distance away, it seemed to have a meaningfully better signal. Not great, but about half of the time I could get a Twitter page update when I tried, with a "connection failure" the other half. That's an improvement. Restrooms: The same restrooms as before remain the closest ones, but now they are that much farther away. It's one of the longest restroom hikes among the city's poker rooms, and it's along a corridor that is chronically clogged with idiots obliviously blocking the path for no good reason. Overall, I think patrons will find not much change from the old room to the new. Oddly, I think the lighting improvement does the most for both the external appearance and the playing experience--not nearly so dreary and dingy now. 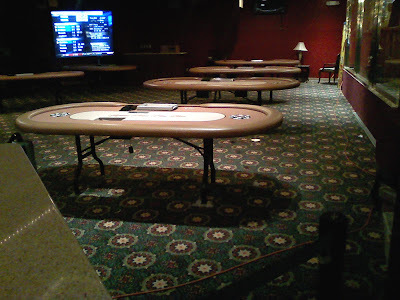 The elimination of the gargantuan tables makes the social experience seem more normal, as well as eliminating the chronic delays that used to result from the difficulties of moving cards and chips between dealer and players. I think the general effect is one of a minor upgrade. Tonight was one of those rare nights where it all comes together. I played my best poker, to the extent that I can't think of a single decision that I would have made differently--at least none that would have mattered more than a few bucks. There were blissfully few occurences of the many things on my list of pet peeves. I played for a few hours at the Venetian and then a few at Imperial Palace, making a decent amount of money in each venue. 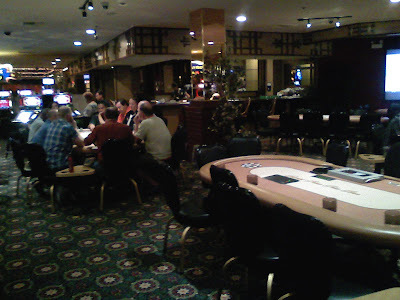 In each place I got to share the table with two pleasant and interesting people (making four in all--very unusual for one day) that I have met through this blog and/or through http://www.allvegaspoker.com/. I had fun with Twitter. I had some good chats with dealers that I like. I generated an idea for a new occasional series of blog posts. I even got to eat an ice cream cone while I played. In short, I had fun, had some good fortune, played well, made some money, and exercised my atrophied social muscles a little. It's pretty rare that all of those things happen in one day. I'm going to try to appreciate the resulting good feeling while it lasts. No matter how good a hand you make, if you are playing in a $2/4 limit game, you are not allowed to yell "Yahtzee!" At some point fairly recently the poker room management at Caesars Palace implemented a new procedure: Dealers are to give the deck one riffle shuffle before placing it in the Shufflemaster. This is incredibly idiotic and completely pointless. But I've ranted about the exact same policy before, when I encountered it at the Rio, so rather than repeat myself, I'll just point you to that post, here. I put in my hours this afternoon at Caesars Palace so that I could be home in time for the Mookie tonight (which is about to start). The only remarkable thing thing that happened was that Linda Johnson played at my table for an hour or so. From the conversations that were taking place, I got the impression that nobody else at the table knew who she was. What? None of you reads Card Player magazine? None of you watches the World Poker Tour? None of you follows poker news, such as the establishment of the Women in Poker Hall of Fame? But soon she turned the conversation to poker cruises and passed out her business cards. Some players still clearly didn't know anything of her accomplishments. 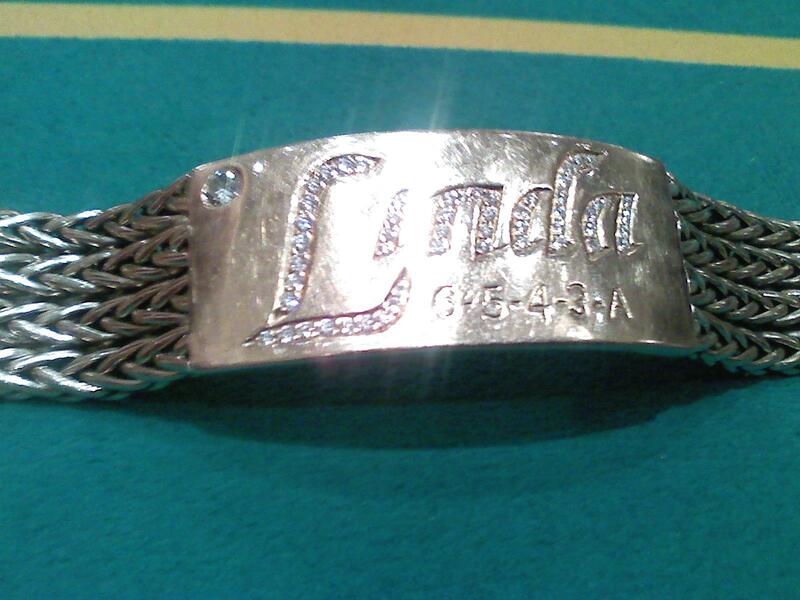 I missed the part of the conversation in which her history of winning an WSOP bracelet came up, but she had it on, and when somebody asked to see it, she took it off and passed it around for anybody who wanted to take a gander. She won this in Event #2, razz, in the 1997 Series. 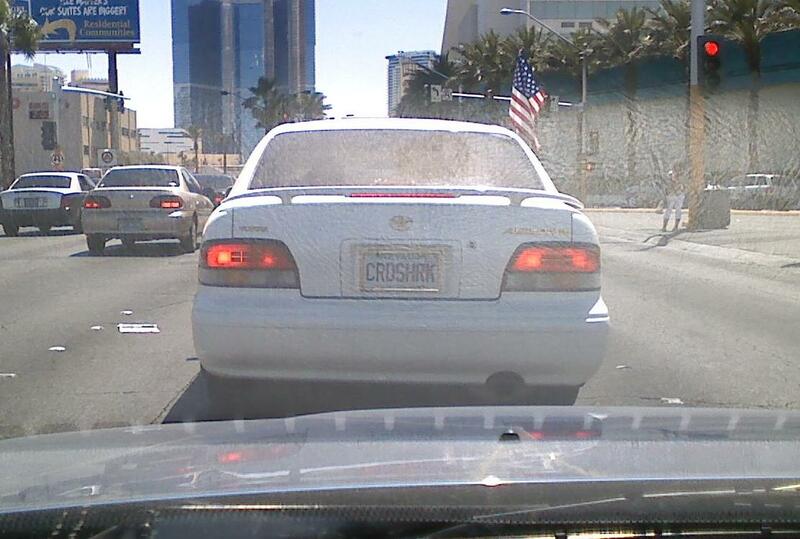 I like how she has had it customized. I assume that 6-5-4-3-A was what she held in the final hand. The underside was engraved with the date and the event. It looked to me like that was there originally, but it's possible that she had that added, too. Nice piece of poker bling! I'm watching the Mogehan Sun event of the North American Poker Tour on ESPN. 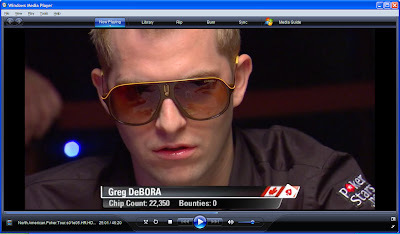 Though the announcers don't mention it explicitly, there was apparently part of the prize pool set aside for an "ugliest sunglasses" contest. At least William Reynolds and Greg DeBora entered. Recently I added columnist Norm Clarke to my Twitter feed to see what juicy Vegas tidbits he might break first that way. Today the Miss USA Pageant contestants arrived, even though the pageant final doesn't take place until May 16. I don't get that, but whatever. Anyway, Miss Kentucky fainted today. 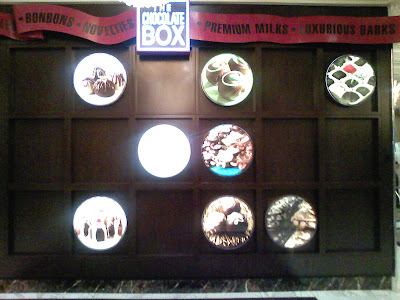 Clarke sent a Twitpic of it, which you can see here. The liberal mainstream media is, of course, blaming this on the heat. But they're covering up the real story. I have it on good authority that a reporter's question is what triggered the collapse. She was asked, "Did you know that your state's attorney general is trying to sue Full Tilt Poker, saying that the state should get all the money that Kentucky residents have lost playing poker online?" WHAM! Down she went in shock. Who can blame her? Realizing the level of idiocy that you are going to be required to represent on national live TV must be horrific. The May, 2010, issue of Poker Pro magazine has an article by Chad Holloway (about whom I know nothing), listing who he thinks would make the best picks for a fantasy poker team in deuce-to-seven events at the World Series of Poker. I wasn't really interested in reading the article. I basically knew who had to be in the number one slot: Billy Baxter. So I flipped the page to get to the end of the list (being presented in Lettermanesque reverse order), and was mighty surprised to find that he had David Grey as his top pick. So I scanned back through the other names to see where he might have ranked Baxter. I was dumbfounded: he hadn't made the cut at all. A digression for a moment, if I may. An event in one of the first couple of seasons of the World Poker Tour had Chau Giang at the final table. I had never heard of him before. Mike Sexton had nothing but praise for him during the player introductions. He said something like this: "People might disagree on who the best five poker players in the world are, but if you make any list of the top five and don't include Chau Giang on it, you have made a mistake." Well, let me steal that sentiment for current purposes: If you make a list of the top ten deuce-to-seven players, and it doesn't include Billy Baxter, you have made a mistake. Period. It's like listing the best chess players without mentioning Gary Kasparov, or best superheros and omitting Superman. Baxter has won seven--SEVEN!--World Series of Poker bracelets, every single one of them in lowball events, including five--FIVE!--in deuce-to-seven. (The others were in razz and ace-to-five lowball.) What record does Mr. Holloway think even comes close to that? 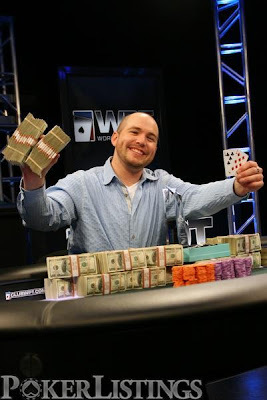 In addition to the wins, Baxter has made eight other WSOP final-table appearances, all of them in lowball events, including five in deuce-to-seven. I mean, just look at the list of his major tournament cashes, here. Go ahead--scan down the list (it will take some scrolling) and see how many single-digit finishes you find in deuce-to-seven and other lowball events. Without even trying to do a comprehensive check, I'd bet $100 that nobody else in history has a record of cashes or final tables in these forms of poker that can top Baxter's. Do we really need to remind anyone that he is in the Poker Hall of Fame in large measure because of his phenomenal, unparalleled, decades-long dominance of lowball poker? When I read the Poker Pro article in a little more detail (once I had decided to rant here about it, I thought I should probably read it first--good idea, dontcha think? ), I learned why Baxter got omitted. The author's methodology was just to use WSOP record books from 2005-2009. 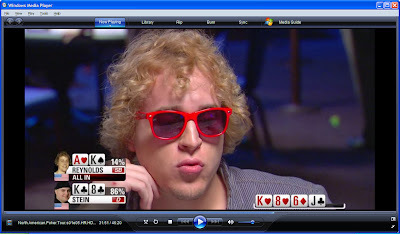 Though Baxter had a deuce-to-seven final table as recently as 2008, his last bracelet was in 2002. Hence, he is off of Mr. Holloway's radar screen. But if you think that on that basis he should be left out of a betting pool for the events that he has dominated like no other player, well, I think you're a fool. If the event is lowball, and Baxter is in the field, only bet against him if you don't like money. It's really that simple. "Let me do my job!" 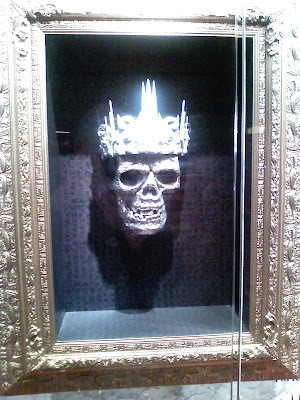 At the Imperial Palace tonight, I ran into a dealer who needs a serious attitude adjustment. I was not involved in this hand, but the final board was 5-2-Q-5-2. After an all-in and call, a young woman showed her Q-2, and a young man showed his A-2. The dealer pushed up the two deuces and two fives on the board, and said, pointing to the woman, "Deuces full of fives," then pointing the man, "Deuces full of fives. Chop it up." Three players--me, the woman with the winner, and one other--in chorus all said, "Deuces full of queens." The dealer scowled, waved his hands, and said loudly and extremely gruffly, "Let me do my job! Let me do my job!" I don't know exactly where this guy is from, but it's obviously one of the former Eastern Bloc nations, so he has that Russianesque kind of accent. The whole display was startling and intimidating. He instantly got the quiet he wanted. He didn't pause to reconsider the situation. Rather, he just set out on a mission to show us how we were wrong. He pointed to the woman's deuce and the four board cards he had previously pushed up, and said, as if he were explaining it to kindergarteners, "Deuces full of fives." Then he pointed to the man's deuce and the same four board cards and repeated, "Deuces full of fives." He grabbed chips to start stacking them, still obviously thinking it was to be a chopped pot. The others were now quiet, but I was far more irritated by his manner than intimidated. I said again, "No, deuces full of queens." He again gave me the nearly-shouted, "Let me do my job!" I was about to call the floor over. I had already made my mind up that my introductory words to him were going to be, "You have a dealer who doesn't know how to read poker hands." I wouldn't ordinarily be that nasty and accusatory, but his whole I-know-better-than-you attitude had made me want to rub his face in his own excrement. Let him have the maximal embarrassment in front of his boss. I was about a microsecond from calling for the floor when the dealer, slightly softened but still sounding edgy and confrontational, asked me, "Where do you see the queens?" I reached across the table and pointed: one red queen on the board, one red queen in the player's hand. Suddenly his entire expression and body language changed, as if he had seen a ghost. He said, "Oh--I see it now. Yes. It's deuces full of queens." The problem here was not that he made a mistake. Dealers, like all people, make mistakes. That's not an issue. The only times that I've made a fuss in this blog about dealers' mistakes are when it's obvious that the dealer has a surprising misunderstanding of some point of the game that one would expect he or she would have gotten straight long ago, or when, as here, there is a refusal to acknowledge a mistake. The problem was attitude. When three players were simultaneously telling him that the hand was not what he thought it was (and it wasn't cacophonous; it was a moment of spontaneous almost choral harmony, three people saying exactly the same words at exactly the same time), he should have paused to wonder if he might be wrong, instead of just trying to press his point more forcefully. Everything about his demeanor in that brief interval conveyed, "You mere players couldn't possibly know enough to be challenging me." He might as well have been South Park's Cartman: "I am a cop and you will respect my authoritah!" 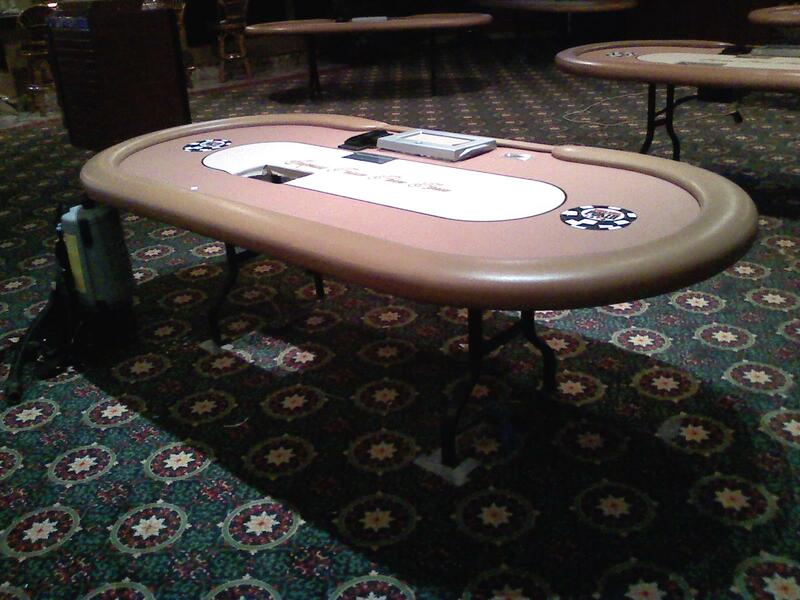 There are certainly times when a dealer needs to rather forcefully assert control over the table. Sometimes tables break out into squabbles, with everybody trying to talk at once, and as a result nobody is being heard and no useful information is being communicated in any direction. In those moments, a dealer has to be able to quiet down the group so that he can think without intrusion for a few seconds, or ask an important question, or explain what a rule is, or whatever. This was not such an occasion. We did not have a multitude of viewpoints and opinions being launched randomly. There was one unified voice, saying four words--and this dealer's reaction to it was over-the-top emotional and defensive. The dealer who thinks he knows it all and is incapable of errors is much more of a problem than a brand-new one who makes a ton of mistakes but is willing and eager to fix them and try not to repeat them. I have all the patience in the world for the latter. But for this guy? None. Tell you what, pal: I'll shut up and let you do your job as soon as you show that you know how to do it. That hasn't happened yet, but keep trying. I was at Imperial Palace tonight. 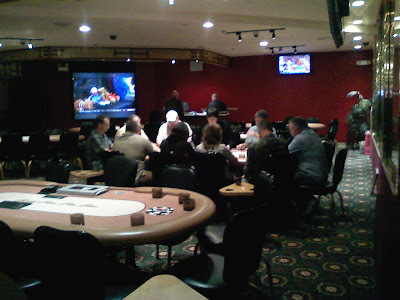 I saw the about-to-be-opened new poker room there, to which I had previously been tipped off by some of my http://www.allvegaspoker.com/ and Twitter friends. It is said to be opening Friday this week. The location is just west of the current room, i.e., in the southwest corner of the casino floor, right next to the Strip-side entrance. It looks like there will be a lot more room between tables, which is nice. The noise and smoke might be slightly less, since they will mainly be coming from one side, rather than having the room surrounded, as is now the case. These tables look to me like ones they set up in other rooms when holding a special tournament. 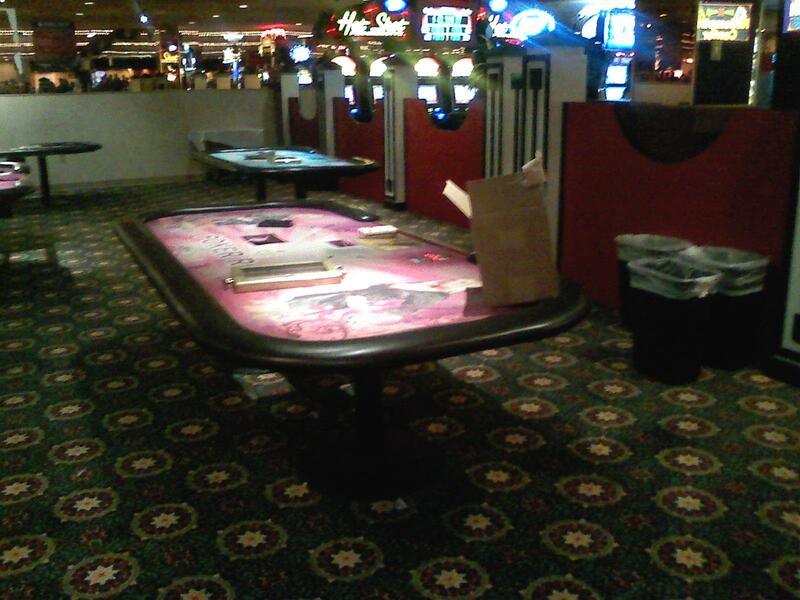 However, the felt has been cut to allow installation of Shufflemaster machines, which suggests that these are going to be the new permanent tables. That would mean, finally, an end to the largest poker tables in Vegas, which has long been one of the IP's minor points of either pride or annoyance (depending on whom you ask). 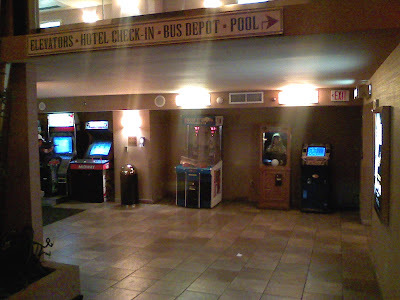 I have a vague memory that the first time I ever played at IP (late 2006) the room was in what will be this new spot, and later got moved to where it is now, so that this upcoming move is a return of sorts. (Maybe you can go home again after all.) But that was only one trip, and everything was new and disorienting to me then, so it's all kind of a jumble in my brain. 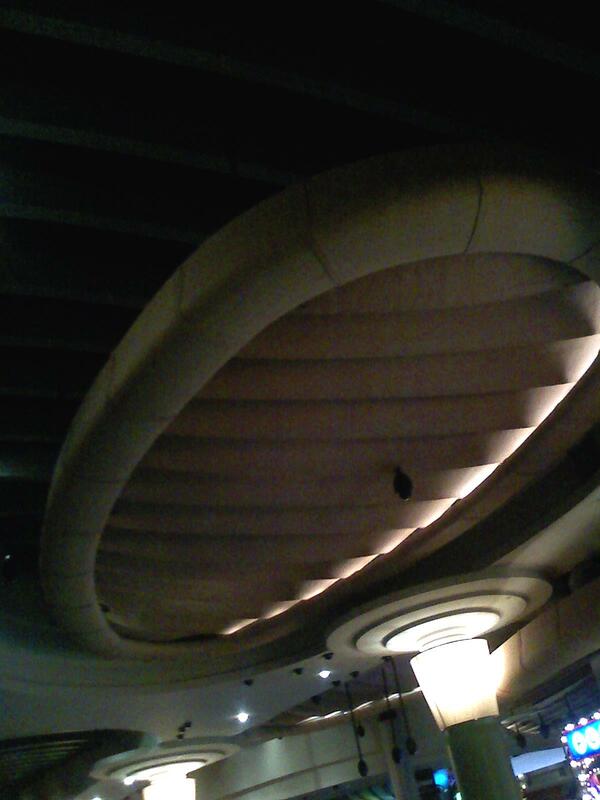 I plan to head back there this weekend and see how the new joint looks and feels--and how it sounds and smells, too. Blogspot tells me that as soon as I hit the "publish" button, this will become post #2500. It has been just over six months since #2000. This all seems astonishing. Nobody could really still be reading, could they? Hello? Is this thing on? Testing, one, two, three? Why would anybody sit through 2500 installments of what I have to say about anything? Are you all masochists or something? Well, whatever the explanation, I'm grateful for your eyeballs running over my pages. I hope you get half of the satisfaction from reading that I do from writing. What's that calculator picture doing up there, you ask? When I did a search for some amusing image to illustrate the number "2500," Google offered up that one. It's a photo of an old Texas Instruments model TI-2500. You can read about it here, the page from which I snuck this picture. I picked it because the photo caused me a little whirlwind of nostalgia. You see, that right there was my first calculator, back in the dark ages. 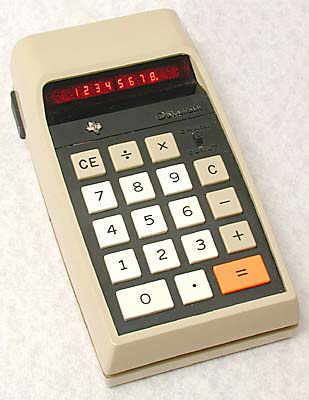 I bought it used from my big brother, who was moving on to a scientific calculator, as he was in high school then. I paid him about $100 for it. He had paid about $150 for it new roughly a year earlier. It was 1974, and I was 13. It was one of the first things I bought for myself with my paper route money. (I've never told you I had a paper route? Well, I did.) That, and an Encyclopedia Britannica, as I was increasingly dissatisfied with the old World Book encyclopedia my family had. 13-year-old kid gets a little cash, buys an encyclopedia and a calculator. Was I geeky, or what? This calculator had a weird property, obviously not intended by its designers. If you turned the power switch to "on" very slowly, or sort of stuttered it back and forth between on and off, the display would spontaneously start counting. The third digit from the right would increase about once per second, with the first and second digits going 100 and 10 times faster than that, respectively. It would just continue counting as long as it was left on, once it started. Very strange thing. One time I let it go for about 12 days, which is how long it took to reach a count of 1,000,000. This amused me much more than it should have. None of that has anything to do with poker or this blog, but sometimes I get into a stream-of-consciousness thing that just keeps going with a will of its own--kind of like that old calculator. It's probably best if I switch off the power for now and let it all reset. McLean Karr raises from the button to 75,000, and Hasan Habib calls from the big blind. The flop comes J22, Habib checks (it may have been in the dark before the flop), Karr bets 115,000, Habib check-raises to 300,000, and Karr thinks for about 15 seconds before he says, "I'm all in." Habib thinks for about 45 seconds before he says, "Alright, I've gotta call you, man." Habib shows K10 for a club flush draw, while Karr turns over 42 for trip deuces. Habib needs to improve to stay alive. The turn card is the J, the river card is the 4, and McLean Karr wins the pot with a full house, deuces full of jacks, to eliminate Hasan Habib from the tournament. Does WPT champion McLean Karr know the power of the mighty Deuce-Four? To quote one of the great lines from Star Trek, "He knows, Doctor. He knows." Incidentally, this should also answer any remaining doubts about what happens when the Deuce-Four runs into crubs: the crubs are no match. Even if they had gotten there (which, it must be noted, they didn't), the Deuce-Four had made a full house anyway. This kind of thing goes on way too frequently at your site. Please remedy it immediately. "Do you filter comments? I understand you would not post comments that are nasty or rude or full of profanities but what about honest questions? I sent a comment regarding making a living at 1/2 and you have not posted it yet. Please post or just answer as I am truly curious." I was about to submit my answer via a responsive comment, but then thought maybe I should make it a post instead, since more people will see it this way. I publish nearly every comment. The most common reason for rejection is something that is obvious spam--and there are several of those a day. Other than that, nearly everything goes through. A couple of times I have rejected a comment that I thought was genuinely libelous, in legal terms. But the total number of comments I have rejected for reasons of content other than spam in 3 1/2 years is less than 10, I think. It's really rare, and when it happens it gives me ulcers, because my general goal is to publish every comment, and when I feel a need to violate that personal policy, it bothers me. Blogger's comments feature has been wonky the last couple of months. It's fairly common that I only get notice of a comment being submitted days or even a couple of weeks after the fact. Also, when I log onto the administrator page, it will tell me something like "13 comments waiting to be moderated," but then when I click on the link to take care of them, none show up, or maybe just one or two. I have no idea what that's about. Perhaps there are some that have been submitted that are in limbo. On some other people's blogs on Blogspot, I have noticed that there is a discrepancy between the number of comments that a blog post says it has, and the actual number that show up when I click on the comments link. I suspect there is some deep and widespread malfunction in Blogger that is responsible for all of this, but I am clueless what it might be. If you submitted a comment and it doesn't show up within a day or two, most likely there is some technical malfunction, and you should try submitting it again, if it matters to you. I know that's inconvenient, but I know of nothing I can do to resolve the glitchiness. Another relevant point: People ask me lots of questions via comments, and I don't feel particularly compelled to answer them. There's no formula; I answer if I have time and inclination. Sometimes I don't think a question is very interesting or important. Sometimes it's something I've addressed before, perhaps many times, and a reader just hasn't seen that content. Sometimes people ask personal questions that are none of their business. Sometimes people ask for advice about poker or their lives or their upcoming Vegas vacation, and I just don't feel like investing the time to give any sort of worthwhile response. It may sound cold, but it's just not my job to take on that role. Finally, people occasionally use the comments to contact me about something, when they really don't want the comment published. That works--as long as you make clear that it's not for publication. But generally it's easier to use email. The email address is and has always been listed in my "profile" there in the left-hand margin. So that's the whats and wherefores of how the comments go. Another fine moment from the NBC heads-up poker show today. In the first hand against Annette Obrestad, Hellmuth flops top two pair with K-4. Obrestad has just bottom pair with 3-2. 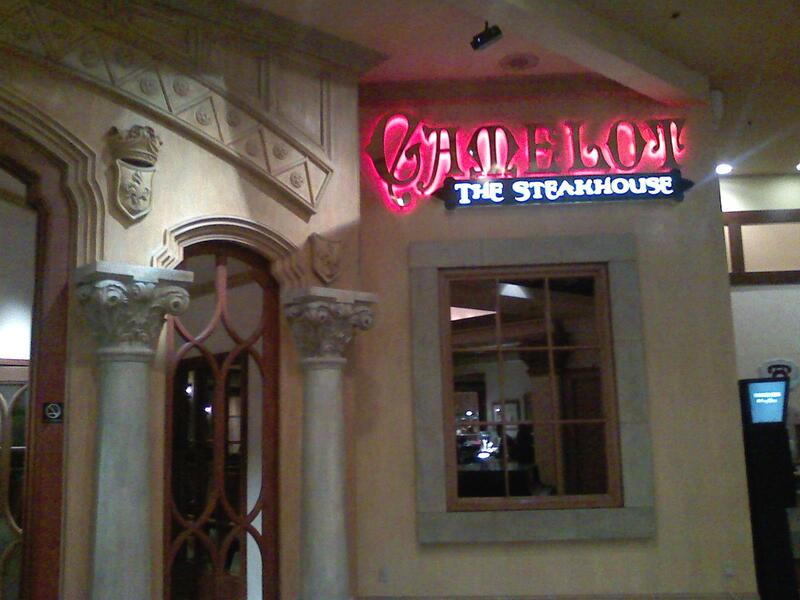 Hellmuth bets and taunts her: "I'll take the first one." She replies, "We'll see," as she calls. The hands are revealed. One of the players is happy. One is unhappy. Can you tell which is which? But the best part was Obrestad's zinger, just to stick the knife in a little deeper: "I think I'll take the first one, Phil." 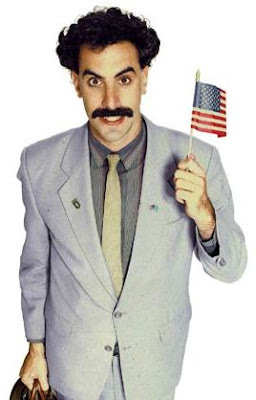 While watching the NBC heads-up matches today, something about how Ali Nejad looked reminded me of somebody else famous. Take a look and think for a minute--remind you of anyone? No? How about if I help you out with a little digital addition? 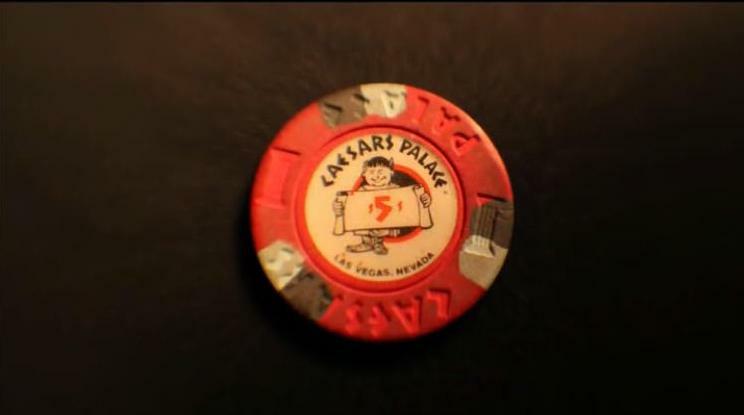 This was on screen for less than half a second, but it caught my eye because I immediately recognized it as not being a standard Caesars Palace chip. I have a few strange Rain Man talents, and spotting non-standard poker chips happens to be among them. It's not real high on the list of superhero powers you might pick for fighting crime, but ya gotta work with what nature gives you. Not only is this not the standard Caesars chip, it's one I'm confident I've never seen before. Mind you, I don't go out of my way to find old or non-standard or commemorative chips. I don't buy them from chip dealers, or go shopping for them online or anything like that. I have never paid more than face value for a chip, and probably never will. But if an unusual one happens to make its way onto the poker table, I'll be virtually certain to notice it, and I'll buy it from the pot if it's one I don't have in my collection. 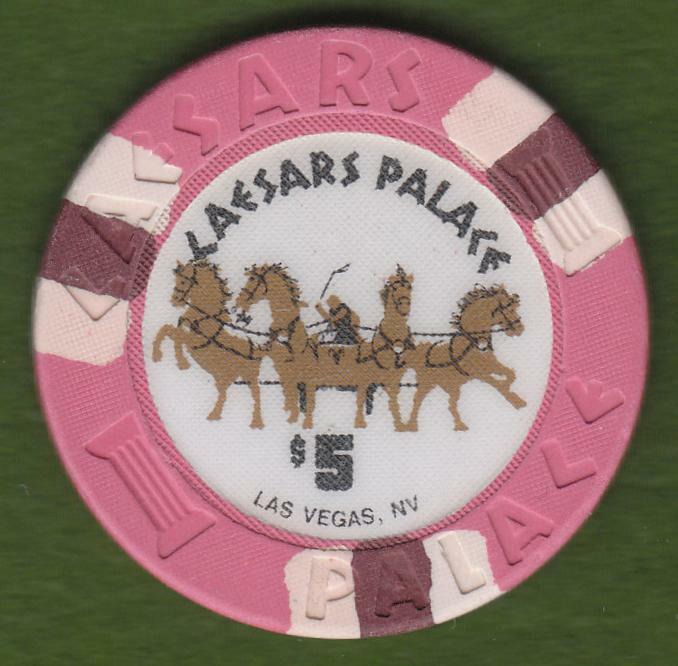 I did find the old chip listed online at a site that specializes in older Vegas chips, here. They're selling it for $19. I wonder how long ago they were replaced with the current style. I'm guessing at least ten years, maybe much more than that, based on how worn most of the Caesars chips are, and the fact that I've played there about a million times and never seen one of the old ones slipping into play. Anyway, this is only noteworthy because it seems peculiar that NBC's video crew somehow got hold of one of these retired chips, instead of just grabbing a current one and getting a shot of that. It seems extremely unlikely that this was a freak accident, and the one chip the cage randomly loaned them for a photo op was the one old one in a million. Somebody went well out of his or her way to get them that chip (or perhaps just a photograph of it)--and then it makes an appearance for just a few tenths of a second, in the middle of a series of shots that nearly buries it, so that only Raymond Babbitt and I would notice it. There's a story behind this little incident. I have no idea what it is, but I'm intrigued. There was an incident near the very end of my session at Caesars Palace Monday evening. A woman in early position raised to $10. I called, holding the two red jacks. The player to my left was on the button, and reraised to $30. The blinds folded. The dealer gathered in all of the bets except for the $20 raise, which was left sitting in front of the button, as that was now the amount that the remaining players would have to call if they wished to continue in the hand. The original raiser announced,"I'm gonna reraise." She picked up stacks of four red chips with each hand and pushed those forward. She then went back to her stacks and repeated this move, bringing out a total of $80 in this way. A couple of other players howled their protest. "String raise!" "She can't do that!" The dealer said it was OK, because she had announced "raise" first. I thought this was damn peculiar, since that announcement doesn't change her obligation to stop putting out chips as soon as she has committed enough to constitute a legal raise, and since she did not announce any specific raise amount. The floor was called, and he made the obvious ruling that her initial move of putting out $40 in chips was the extent of what she could do, because that was a full raise (even if a minimal one--$20 for the call, plus another $20). 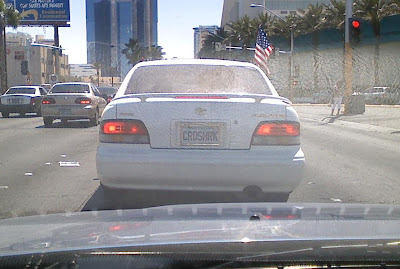 After he had walked away, the dealer said, "That's a new one. Must be a Caesars house rule." Caesars Palace is in the midst of a big tournament series, so they have brought in a bunch of temporary dealers to supplement their usual staff. This guy was obviously one of them. 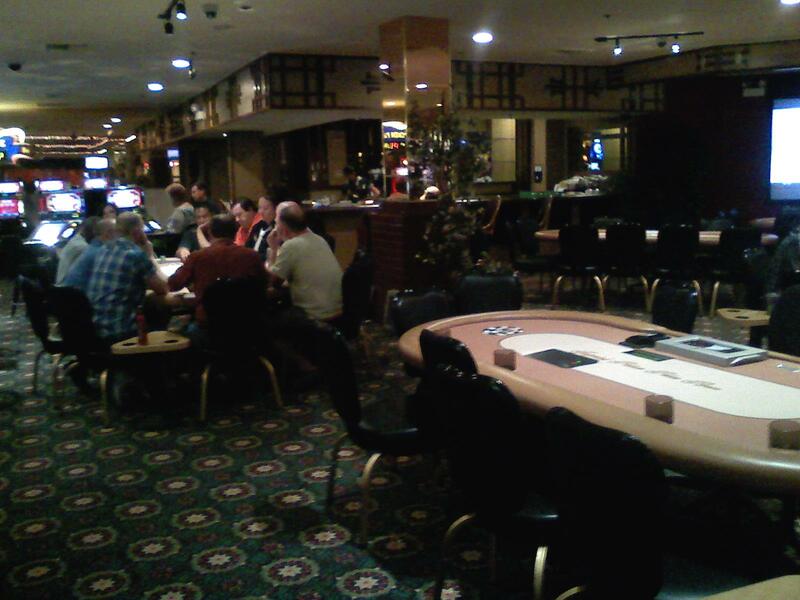 However, as one player vociferously (and correctly) pointed out to the dealer, this is not a Caesars house rule. Rather, it is the standard rule, and would be enforced exactly the same way in every poker room in Vegas. The dealer shrugged his shoulders and said, "That's not how they do it at the Commerce." In the midst of the initial confusion, before the floor had been called, I had heard another player inject, "This isn't California, dealer." The combination of that comment plus the dealer's observation make me think that perhaps it is done differently in at least some California casinos. If readers have personal experience to either confirm or refute that, I'd like to hear about it in the comments section. Anyway, it was very strange to have a dealer not know what constitutes a string raise, as it is one of the most common violations that a dealer is called upon to enforce. I don't think I've ever before encountered one who didn't know that rule. For the record, you essentially have three choices for putting in a raise. (1) Announce the amount of the raise (or the total amount you are going to bet; i.e., the sum of the call and the raise), in which case it doesn't matter how many moves to your stack you make to get the right number of chips into the pot. (2) Say nothing, and push all of the chips you wish to bet (the call plus the raise) forward in one motion. (3) Announce "raise" without an amount, put out chips to constitute the call, then with one additional movement forward put out the additional amount of the raise. 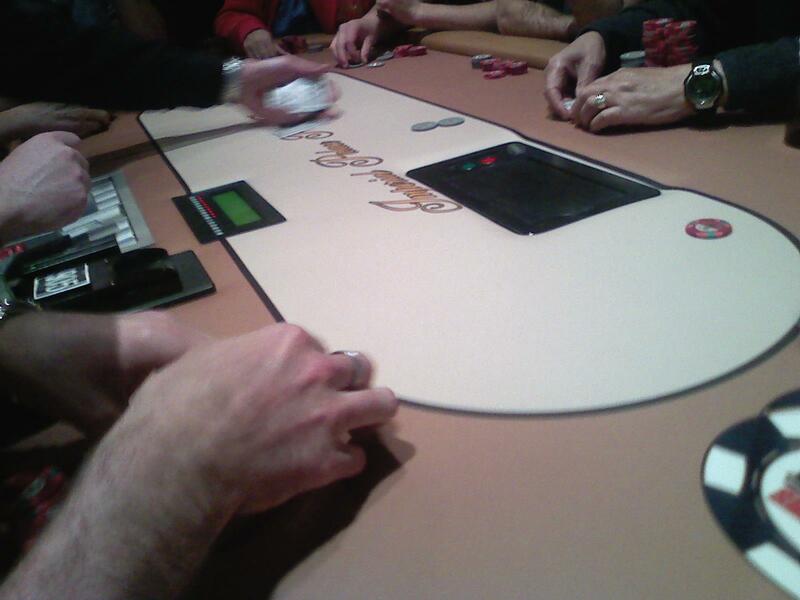 While I'm on the subject of dealers not knowing basic rules, a few days ago I was playing at the Riviera. There were three players left in the hand on the river. (I was not one of them.) 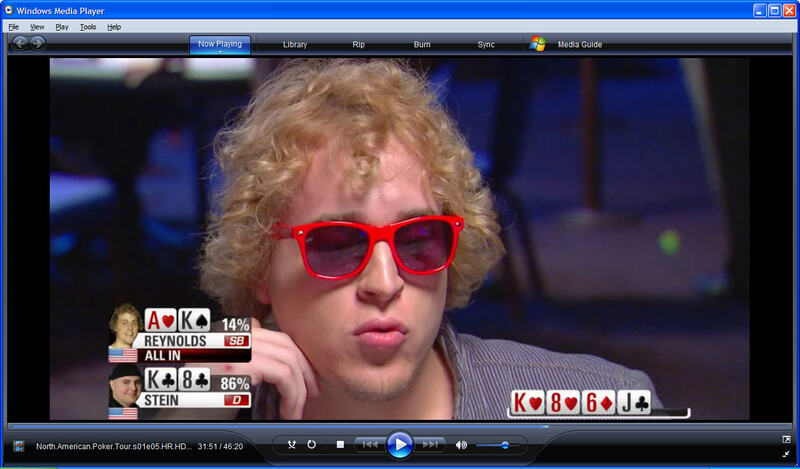 The player who was to be second to act went out of turn, moving his entire stack forward. When it was pointed out that it was not his turn yet, he apologized and took his chips back. The first player then checked. This second player then checked behind. I immediately asked the dealer, "He can move all-in out of turn, and then check when it's his turn?" She said, "Yeah, sure, it's no problem." The last player checked, too. It seemed that nobody who would be directly affected by the action cared to contest it, so I didn't argue further. But a little while later I headed over to the counter, described the situation to the floor guy, and asked him if the Riviera used some non-standard house rule to cover that situation. He said no, and emphatically agreed that the player should have been held to his all-in bet when it was checked to him. He was surprised that the dealer had handled it incorrectly. He said he would have a chat with her at her next break. There are some obscure rules in poker that cover rare situations. Even after having been to dealer school, even after having read a couple of poker rule books cover to cover, even after playing most days of the week for four years now, there are still occasionally situations that come up for which I don't know a rule, and have to look it up later. For example, a dealer friend recently emailed me a question about the so-called "fourth-street rule" in seven-card stud. While both he and I knew the rule and its usual application, neither of us was sure how it should be applied in the situation he described to me. My initial guess was wrong, as I discovered later when I checked my published sources. 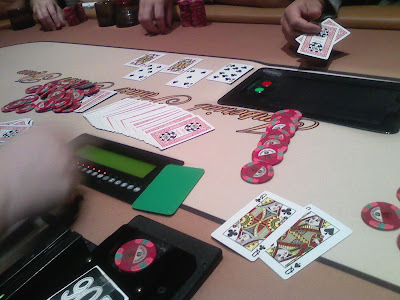 As another example, during a mixed-game tournament at Treasure Island in March, I made an error with respect to posting the bring-in with an oversized chip during a stud round. An off-duty dealer (and reader--hi, Pete!) playing at the table pointed out to me that somebody being nitty could hold me to having made a complete bet rather than just the bring-in amount. I hadn't ever thought about it before. But string raises and out-of-turn action are things that happen not just every day, but many times a day. It is hard to understand how a dealer--other, perhaps, than one on his or her first day on the job--could not know how to apply them. It's not quite as bad as not knowing whether a flush beats a straight, but it's close. I'm watching this week's "Poker After Dark." In Wednesday's first segment, Jean-Robert Bellande is short-stacked and moves all-in with K-Q offsuit. He is called by Mike Matusow, with 10-10. 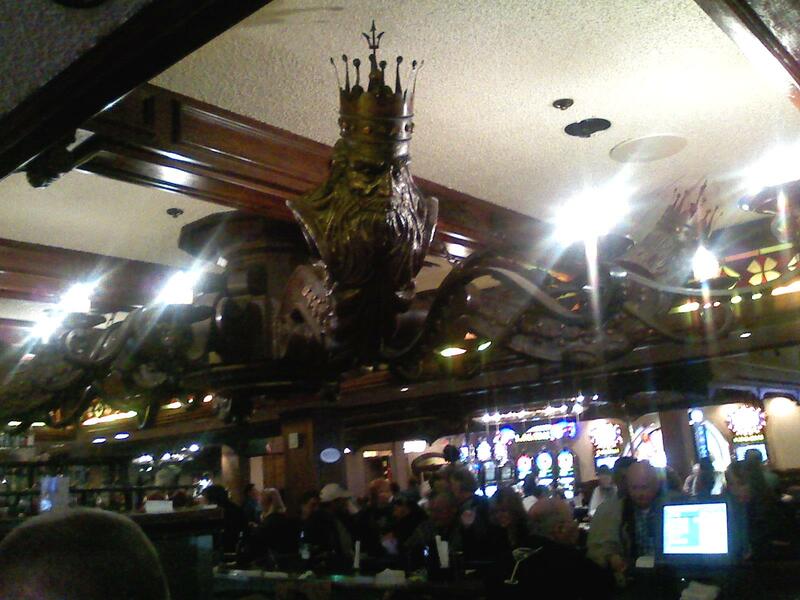 Bellande catches a queen on the flop, but Matusow hits his two-outer on the river for trips. As you may know, for the past couple of years Matusow has been on a "positive thinking" kick. From various interviews and on-camera statements during televised tournaments, it's clear that he really, sincerely, genuinely believes that keeping his thoughts positive affects for the better not just his decision-making, but how the cards come. You all know by now how I feel about this kind of hooey, don't you? If not, go here to read what I wrote about Jason Alexander, and here to read what I wrote about Shannon Elizabeth, both of whom have publicly espoused similar nutty ideas about poker. Want to see how stupid this crap is? Consider how it has affected Matusow. Upon seeing that lucky river card, he tells Bellande, "Now you just lost to a guy who hasn't won a coin flip in the last 30 coin flips, and was sitting there expecting to lose." I see. So that positive thinking is pulling in great results, eh? The outcome of the channeling of your mental energies has been that you now win 1 out of 31 of your 50/50 propositions. Wow. Yeah, that's how I want my tossups to turn out, so, sure, sign me up for this awesome program that you've embraced. I wants me some results like that! Matusow continues uninterrupted: "But, see, I stayed quiet and stayed positive." Uh, OK. So you were sitting there "expecting to lose" while you "stayed positive." The man is so stupid he can't even utter two sentences in a row without contradicting himself. Want another example? On this week's "High Stakes Poker," he and Daniel Negreanu both move all-in on the flop. Negreanu has an overpair--tens--while Matusow has Ac-Qc, for two overcards and the nut flush draw. 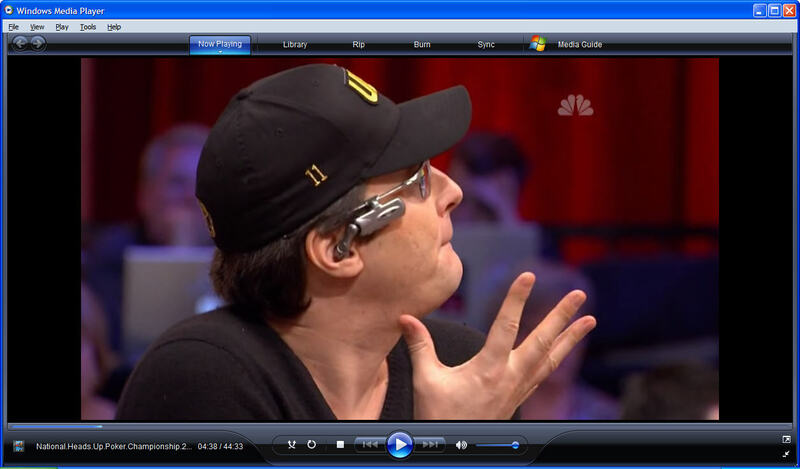 Matusow says to somebody (not clear who he is addressing), "That's the worst hand he could have had." That's actually about right, given how the betting went. OK so far. But Negreanu hears that comment and asks, "You're upset I called, Mike?" Matusow replies, "No. I knew what you had. I thought you had nines." Right. So first you say that pocket tens was the worst hand that Negreanu could have had to make the all-in call. Then you say that you knew what he had (tens). Then you say that you thought he had nines. It gets better. When the hand ends, they cut to an interview with Matusow conducted later, in which Kara Scott asks him his thoughts during the hand. He says that when Negreanu called his pre-flop raise, "I at this point for sure put him on tens or jacks, maybe even queens. I was hoping it wasn't queens." So let me get this straight. You were "sure" that he had tens or jacks. Unless he had queens. Or unless he had the nines that you thought he had. But you "knew" what he had. Matusow, do you even have enough brains to realize how idiotic you are? Matusow is such a dunderhead that I propose dropping his nickname. I shall no longer refer to him as Mike "The Mouth" Matusow, but instead as Mike "The Moron" Matusow.